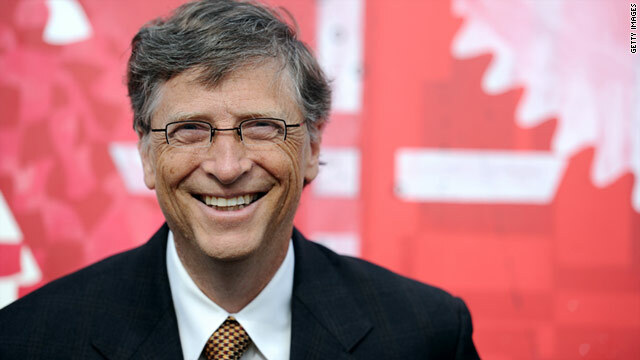 Microsoft founder Bill Gates has now given $28 billion to charity. His kids like to tease him by singing the song "Billionaire"
(Mashable) -- In one of his most candid interviews ever, Microsoft founder Bill Gates (the world's second-richest man) revealed personal details never heard before, along with a little tidbit that he was probably supposed to keep secret. 1. His kids like to tease him by singing the song "Billionaire" by Travie McCoy and Bruno Mars. 2. He's now given $28 billion to charity. 3. His three children, currently aged 15, 12 and nine, will reportedly inherit $10 million each (although Gates wouldn't disclose that amount in the interview), a slender sliver of his $56 billion net worth, because Gates says, "I don't think that amount of money would be good for them." 4. Did U2 star Bono invite Gates backstage when U2 was performing in Seattle? Not necessary, because Bono was staying at Bill's house that night. 5. Now dedicating his career to his $37.1 billion charitable foundation, Gates says when asked if he'll return to Microsoft full-time: "No. I'm part-time involved. But this is my job now." 6. Why try to cure malaria instead of cancer? Says Gates, "The world is putting massive amounts into cancer, so my wealth would have had a meaningless impact on that." 7. He haggles for good prices on vaccines: "We are super-smart about what we pay. We get price reductions. We can track how many kids get the vaccines." 8. People in Third World countries have no idea who he is. "They don't know who I am, because it doesn't relate to their world. I went to one place with the chief minister and someone said, 'Who is this guy? ', and the chief minister said, 'This is a white-skinned guy I brought with me.'" 9. He has a Twitter account, but had a problem with Facebook: "... Because the friend requests got out of hand." 10. And the secret: Gates inadvertently revealed that his friend, Facebook founder Mark Zuckerberg, is engaged to longtime girlfriend Priscilla Chan. During the interview, Gates was talking about Zuckerberg and referred to Chan as Mark's "fiancée Priscilla." Oops. "Facebook's head of communications Elliot Schrage suggested that Bill Gates was mistaken. 'If [Mark is engaged, Bill Gates] knows something I don't know. Gates's communications guy just wrote to apologize for the misunderstanding.'"